A couple of years ago, KasparovChess.com interviewed South African IM Watu Kobese. This interview is refreshing look at one of Africa's brightest hopes for its next Grandmaster. In the interview, Mark Rubery asked a question pertaining to the legendary story of an 8-year old Kobese challenging then-champion GM Anatoly Karpov in a match!! "No I do not think so, although going to a chess school in Germany might have had the most influence on me from a chess point of view. It was very clear to me as I grew up that the quality of education, for example, was a lot more inferior for a black person. Even at a very young age one could see the difference in many things so I guess this must have had some effect on me although as far as my chess development, it would be more of a general thing than anything specific." In terms of the state of chess in South Africa proper, Kobese feels that there are too many divided interests in South Africa which may result in tremendous friction and repeated failures in organizing. In Africa, Kobese mentions both Egypt and Angola as having developed a number of talented players. Since the interview, Africa has produced a couple of bright young talents in IM Amon Simutowe of Zambia and IM Robert Gwaze of Zimbabwe. The 20-year old Simutowe needs only one more norm for the GM title. Both Zambia and Uganda have produced players showing some promise. The problem as Kobese points out is the disillusionment that can occur once there is no support for promising players. 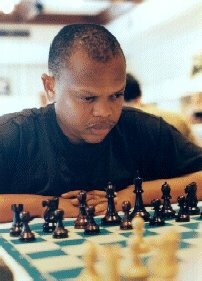 Kobese, haven beaten players such as GM Judit Polgar, GM Kevin Spraggett, and GM Peter Leko, stands to make his mark in African chess history as one of the continent's next Grandmasters (GMs Slim Bouaziz of Tunisia and Hichem Hamdouchi of Morocco were the first African GMs of record). Read the entire interview by Mark Rubery and an earlier interview by the French site, Notzai. Editor's note: At press time, there is a more recent piece done on IM Watu Kobese titled, "Black Knight moves to Another Board" by Belinda Beresford. This brief reiterates some the same arguments as in the KasparovChess.com article and goes into some depth about the situation in South Africa. Initiatives to spur growth in an unsupportive environment are highlighted. Surprisingly, this article mentions that IM Kobese will not represent the South African national team in the 2002 Olympiad in Slovenia. Disgruntled at the lack of support of the South African Chess Federation, he will be coaching the Botswana national team.